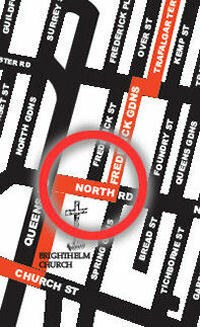 North Road was originally a mediaeval field boundary. It was the main shopping High Street when the North Laine was the industrial centre of Brighton. Trams ran up and down here until the 1930s. After the Second World War, the whole area went into decline as manufacturing moved out to the Brighton estates. There is a stark modern building, with a cross on the far right-hand facade. This is the Brighthelm church and community centre. 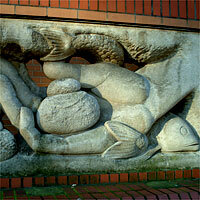 On the wall of the Centre, there is an attractive sculpture by Eric Gill, illustrating the loaves-and-fishes parable. My ancestors were listed as living in “North Place” in 1871. Can anyone tell me where that was? John Skelton is a nephew of Gill’s who studied with Joseph Cribb (Gill’s first apprentice) and Cribb incidentally also has a number of works on buildings around the town – the fire station, Regent House next to the Chapel Royal and the old Brighton and Hove Herald office now ‘ha ha’ bar. Reference the Loaves and Fishes sculpture at the Brightelm Church-and-Community Centre in North Road. The caption states that it is by Eric Gill whereas in fact it was by John Skelton who, if (memory serves correctly), was a student of Eric Gill. I was the Church Secretary at the time if its creation. Why hasn’t this error been amended?